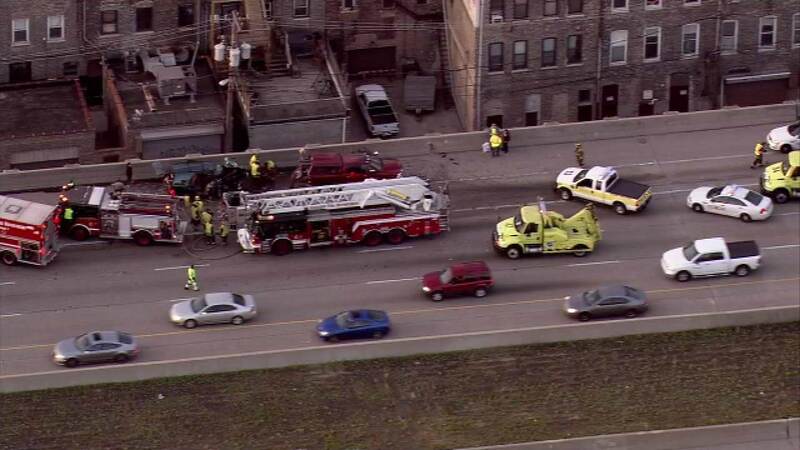 CHICAGO (WLS) -- A fatal crash on the inbound Stevenson Expressway on the northbound ramp to I-94 snarled traffic into the city Wednesday morning. Illinois State Police kept several lanes closed for nearly three hours after the crash. The three-vehicle, pin-in crash near Damen occurred around 5:45 a.m.
A Green 1997 Ford Expedition appeared to have sustained the most damage. A burgundy Dodge RAM and blue 2005 Honda Civic were also involved. A 28-year-old Chicago man, who was a passenger in the Expedition, was pronounced dead at Mercy Hospital. The 25-year-old driver of the Expedition was transported to Stroger Hospital with non-life threatening injuries. Police say the Doge RAM was driven by a 54-year-old Burbank man, with two Chicago men, ages 47 and 53, as passengers. One of those passengers suffered non-life-threatening injuries. A 60-year-old Lemont man driving the Civic was uninjured. Police say all involved were wearing seatbelts except the occupants of the Expedition. Police say the Expedition was traveling on I-55 northbound at Throop St. at a high rate of speed in the middle lane, then the driver then decided to change lanes and take the exit for I-94 northbound. Police say the Expedition did not slow down and rear-ended the Dodge. The force of the impact caused both the Ford and Dodge to strike the concrete wall on the right side, which also led to the Dodge rear-ending the Civic, police say.